Yet again, I'm doing a pregnancy update late in the week. I'm closer to 20 weeks now, but that's OK. Not a lot is different this week, so I thought instead of talking about any symptoms or "changes," I'd focus more on how we're preparing for baby. I have an appointment tomorrow afternoon, so I should have more stuff to chat about then. It's been dreary and dark all week, so please excuse this blurry bump shot. First of all, working from home has major perks when it comes to a maternity wardrobe. I've been sticking mostly to yoga pants and loose T-shirts I already own. I bought a few new maternity camisoles at Target. Otherwise, I've been picking up a few stray items, like those jeans above, from second-hand shops like thredUP. 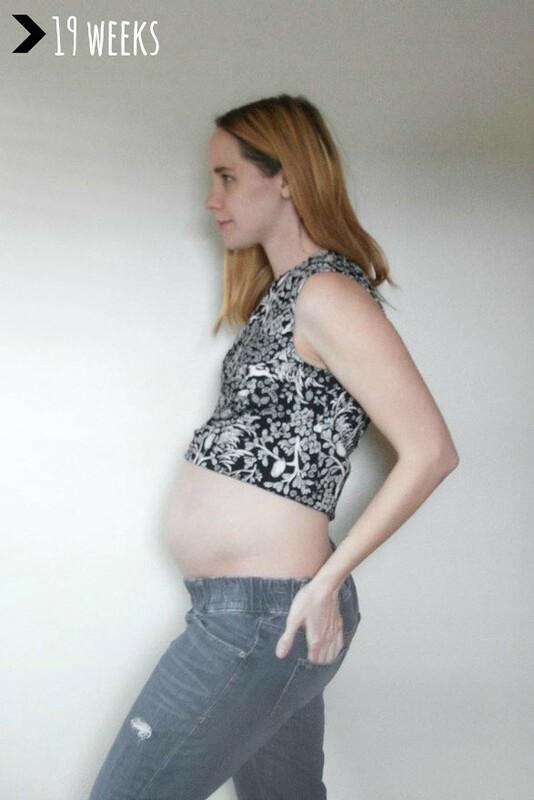 Related: I also sold most of my old maternity wardrobe on thredUP. Somehow I was a size XS back then? I used my earnings to buy a few things that actually fit me now! OK. Aside from that, I've also been buying some clothes for Baby E. (BTW: Good name guesses -- some of you got it right, but we're likely not sharing until birth.) Ada was born in November, so the bulk of her newborn and 0-3 month wardrobe is made up of cozy fleece and long-sleeved things. Of course, that gives me the opportunity to shop for a summer baby! Again, I've been loving second-hand shops for baby clothes as well. Stephen and I went on our mini-Babymoon to Ithaca, NY, last weekend. There's no shortage of great places to scope out good deals. 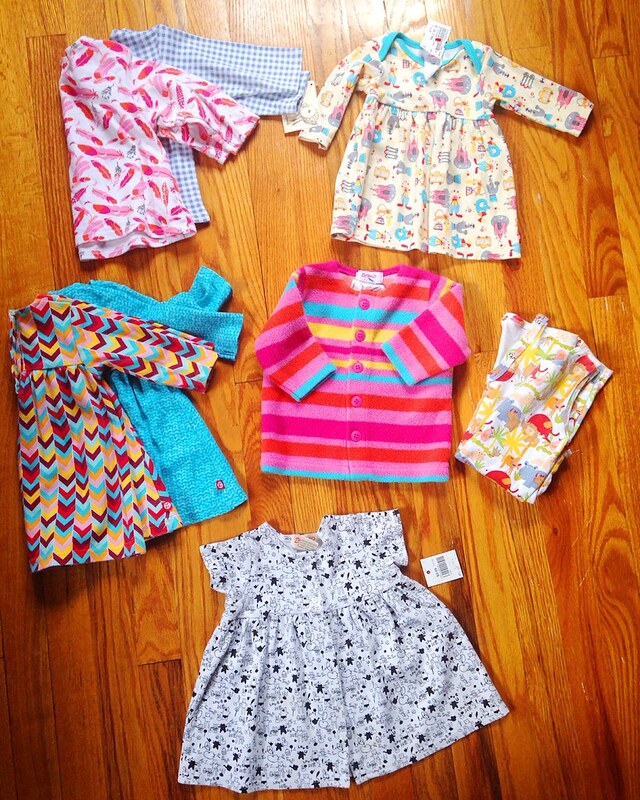 I hit up Jillian's Drawers for a few gently used newborn prefolds (Thirsties) and clothing items. Mama Goose is another joint I'd been meaning to check out for, well, years. It did not disappoint. I found tons of adorable clothes, etc. here for good prices. Can't wait to go back in the future. There's also one of those Once Upon a Child stores in my area. I went there yesterday with my mom and found a ton of Zutano (my favorite!) shirts, dresses, etc., all for less than $25. Oh, and I also found a Snugapuppy Bouncer there for half the new price. It will go with the Snugapuppy Rock 'n Play we got for napping in those early days. I've ordered a bunch of things off Zulily too. Mostly gear. A while back they had an amazing deal on an Ergo Original, so I snatched one up. I also found some Aden + Anais swaddle blankets (milky way! ), a few clothes, and I have my eye on a few matching ensembles. I never thought I'd say that. Some of you have asked if we're doing cloth diapering again. The answer is YES. Though I did get a bit jaded when I ruined all our old cloth diapers, I was able to salvage a few. I thought about the cost and environmental impact of doing disposables, and cloth just made more sense . . . again. 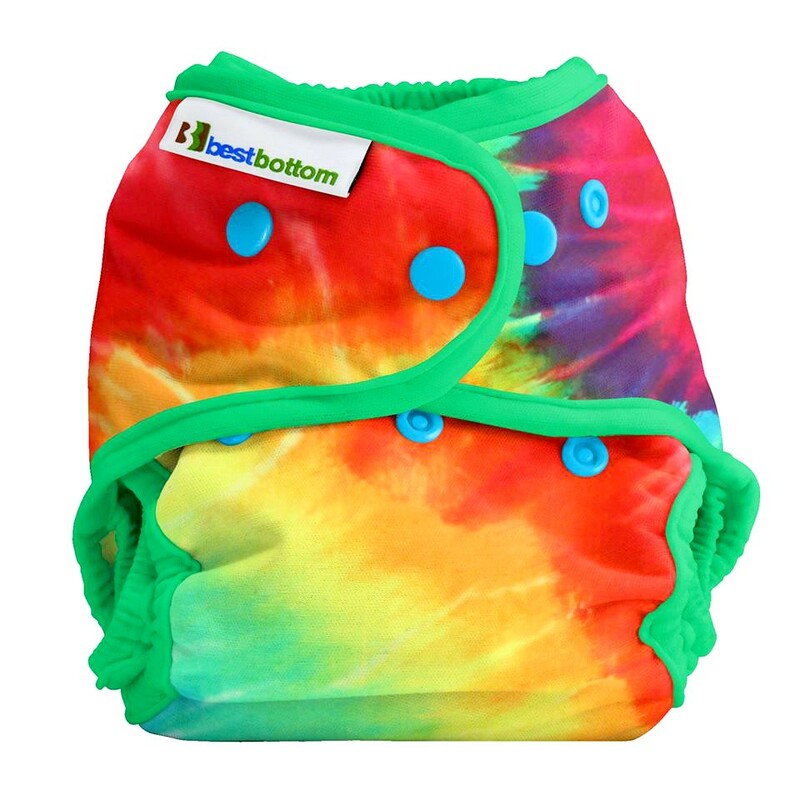 We're doing the Best Bottom System for the bulk of our diapering. I bought 8 Best Bottom Snap Covers in various prints. My favorites are the tie-dye and cow. After watching some YouTube reviews, I determined that instead of buying inserts in the small, medium, and large sizes . . . I'd get all mediums (18) of the Hemp/Organic Cotton inserts. Several people said they worked well for small to large babies at this size. I'll be sure to do my own review in time. Basically, you snap the insert into the cover and can re-use the same cover several times versus changing the entire diaper (like we did with our BG AIO's). I am also hoping the hemp will help keep odors at bay. That's pretty much it for now. As I wrote this post, I got a Braxton Hicks contractions. Eeek. I hope that doesn't mean they're starting. I've noticed a few in the last several days. I know I'm overly sensitive, but I just really hope to skip over that part this time around. See you back tomorrow with a cooking video!